Mauricio Kagel is a conductor, writer, teacher and self-taught composer, initially influenced by avant-garde figures such as Boulez and Stockhausen. During the 1980s, however, his musical language became more conventional, although it could never be called nostalgic. Szenario, scored for string orchestra and tape, was conceived as an independent work, but quickly found a new role as musical backing to the Luis Bu�uel/Salvador Dal� silent classic Le chien andalou. Duodramen can be heard either as an orchestral song-cycle in the tradition of Mahler or as an operatic �final scene� in the tradition of Wagner or Richard Strauss. 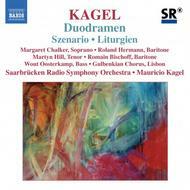 Composed during 1989-90, Liturgien is Kagel�s take on a sacred service so as to illuminate its musical essence from a new perspective. The soloists are joined by the Gulberkian Chorus of Lisbon, and accompanied by the Saarbr�cken Radio Symphony Orchestra, formerly praised for their �excellent playing� by MusicWeb. The composer himself conducts.